Jan Pogue, publisher of Vineyard Stories. When Jan Pogue hands authors the first bound copy of their book, she watches their eyes as they gently take hold of it. Vineyard Stories is a book publishing company that helps bring to life the untold tales of the Island, helping new and seasoned writers evolve ideas into published works. 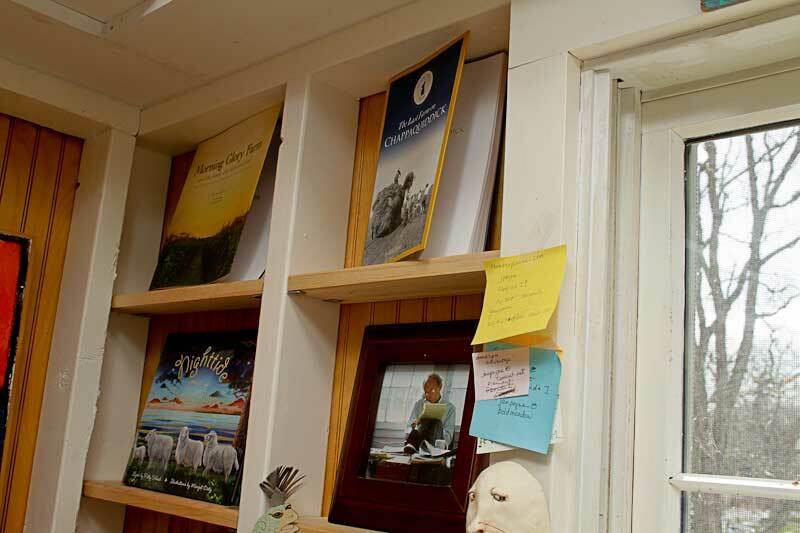 Children’s books, history, novels, cookbooks, memoirs—Vineyard Stories looks into every corner of the Island and unearths a story never heard before. At her Edgartown home this week, Ms. Pogue admitted the process is tough, but the journey is worth it. Vineyard Stories began in Ms. Pogue’s living room in 2005, when she and her late husband John Walter invited friend Art Smadbeck over for dinner. Ms. Pogue announced the couple’s plans to begin publishing books. Mr. Smadbeck returned the next day with a series of columns his mother wrote for the Amsterdam News, the leading African American newspaper of the day. In August, Vineyard Stories will publish its 25th book. This summer alone, Ms. Pogue is publishing five books including; the Chappy Ferry Book by Tom Dunlop; To the Harbor Light, a book about the lighthouses of Cape Cod; Nantucket and the Vineyard by Alison Shaw; Home Bird: Four Seasons on Martha’s Vineyard by Laura Wainwright; Where the Horses Fly by Jacqui Boulter, a children’s book about the Flying Horses carousel; and My Blue Butterfly by Mercedes Alvarez Rodman, a bilingual book in both English and Spanish about an El Salvadorian music program. Ms. Pogue’s favorite, and possibly most challenging project to date, was Edo Potter’s memoir, Pimpneymouse: The Last Farm on Chappaquiddick. At first Ms. Pogue was skeptical of the manuscript, which came to her as a large stack of anecdotes. After a year of editing, Mrs. Potter’s book took shape. A good and successful book goes beyond a beginning, middle and an end, Ms. Pogue said. It comes at life from a different, unexpected angle, so different that even the author may not realize what he or she has. Ms. Pogue spent 20 years as a newspaper reporter and editor at the Philadelphia Inquirer and USA Today, among other places, before writing 12 books on authorized company histories at a small niche publishing house in Atlanta. She moved here with her husband in 2002, when Mr. Walter became editor and publisher of the Vineyard Gazette for a year and a half. A few years later, Vineyard Stories was born. There have been two books that changed the company “pretty drastically,” Ms. Pogue said. The first was Allen Whiting: An Artist at Sixty, which was a retrospective of the painter’s works. Ms. Pogue said the book showed the company “what a beautiful book could be” while introducing Vineyard Stories to the Island. The second was Morning Glory Farm and the Family that Feeds an Island, which weaves the story of the largest farm on the Vineyard owned by Jim and Debbie Athearn, with recipes and mementos. It was bound to be an instant hit, with glorious photographs by Alison Shaw and text by Tom Dunlop, but one month after work began on the Morning Glory book, Mr. Walter died unexpectedly in 2008. The Morning Glory book remains the largest printing in the company’s young history. There was an intial run of 6,000 copies but just a month into sales Ms. Pogue had to order another 6,000 copies to finish out the summer season. 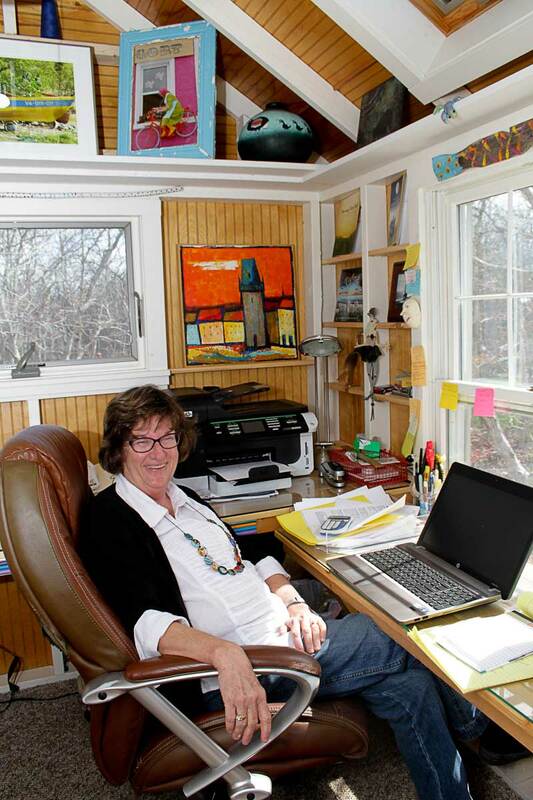 When she’s not coaching authors, Ms. Pogue writes a popular blog on the Vineyard Stories Web site, where she documents Island life and the people behind the stories that define the Island. She works in a treehouse office that once held outdoor furniture but was converted last year into her work space among the birds with skylights, art from around the world, and books by Vineyard Stories. A small picture of Mr. Walter hangs in the window. In the ever changing world of the book publishing industry, Vineyard Stories continues to thrive. For more information on Vineyard Stories visit vineyardstories.com. Remy's profile nails the spirit of a Vineyard enterprise and the gumption and savvy of the woman behind it. She's the consummate editor: one part visionary, one part mother, two parts drill sargeant. With all due respect to Jan's late partner John Walter, who gave Vineyard Stories its wings, it was Jan who punted the baby out of the nest and made it soar. I imagine a wide grin across John's face.